Located 2.3 miles east of Grand Marais off of Highway 61 above Croftville Road. This adorable 1 bedroom, 1 bathroom cabin has a large lake-facing back deck. The open layout has a kitchen, living room, and dining room area. The dining room area has a love seat and flat screen TV. The kitchen is small, but equipped for preparing basic meals during your stay. Enjoy your meal at the dining room table. There are great views that you can enjoy throughout the day. The bedroom has a full size bed and attached bathroom. The attached bathroom has a walk-in shower. The charcoal grill is included for your BBQing pleasure. Enjoy great views of Lake Superior- you`re so close you can hear the waves. You will love this quaint cabin located close to Grand Marais, but far enough away from the hustle and bustle. Located off Highway 61, 2.3 miles east of Grand Marais, just above the popular Croftville Road, this one-bedroom cabin is a conveniently located, charming retreat with all new furnishings. It has a 180 degree Lake Superior view from your lake-facing deck. This private ridge line property sits on 1/2 acre about 60 feet above lake level and 100 yards from the shore, but it's still close enough to hear the waves splashing against the Lake Superior shoreline. Shoreline access is available in front of the Opels Lakeside Cabins which are a short 3-minute drive away. Because of its close proximity to Grand Marais, this quaint cabin is perfect for someone taking a class at the Grand Marais Art Colony or North House Folk School or just wanting a private spot to relax. Kitchen - Dishes, Pots, Flatware Provided, etc. Hillside 360 Tour from Cascade Vacation Rentals on Vimeo. Perfect location just minutes north of grand marais out of the hustle and bustle of town, a really short drive! Cute rustic cabin- I plan to go here every year I visit. I highly recommend!! 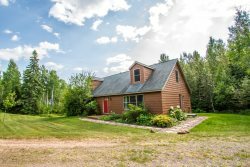 This house is located just a quick drive into Grand Marais and is a perfect spot for staying if you are taking a class at North House Folk School. It's adorable, tidy, and comfy. We have rented 2 cabins with Opel and we really loved this one. We will be booking this cabin again. The layout was perfect, it was clean, had everything we needed and view was wonderful. We really like the seclusion not having another cabin next door. Renting with Cascade is very convenient for us. Love the website to look for property. Great communication with us on the rental details.